If you want customers to keep coming back to your business, you need to make sure that your business is easy to spot and easy to find. Wayfinding signage can help attract new customers, and can help customers easily navigate your business. Make sure that your business is designed to flow well with human traffic, and research the best ways to set up displays. In the business world you can’t expect to be able to have a lot of customers if you don’t know anything about the customers you’re trying to attract. Since you’re new to the business world, do a little research on your competitors and see what they do to keep their customer engaged. Learn about what they look for in a product or service, study their buying behavior (remember to pay attention to the prices they’re willing to pay for certain products), and think about potential untapped markets your customers would be interested in. Look for current industry statistics so you can see what people want, and try to see what the next big trend will be. Using interactive signage from RedyRef, can appeal to any potential customer, especially the ones who always love new technology. You probably already have a Facebook account or a Google Plus profile, so you already know how great social media is for staying in touch with people. The right social media can help promote your business, and can help reach a wide range of customers. Make your business a special page on Facebook, and get a Twitter account for informing your customers about daily deals. Also make sure that your happy customers go online and write good reviews for your business. You can also use your Wayfinding signage to advertise your social media accounts or a QR code to give them even more information about your company. Have you always dreamed of owning a small business? If so, you aren’t alone. According to the Small Business Association, U.S. Department of Labor, and the U.S. Census Bureau there are 27,500,000businesses in the U.S. Those numbers are promising, but that doesn’t mean that opening a business will automatically mean that you’ll be successful. Data from the Small Business Association, U.S. Department of Labor, and the U.S. Census Bureau also show that an estimated 675,000 businesses closed in 2010 and 65,250 went bankrupt. Some of these businesses may have been mismanaged, had bad advertising, and others may just not have opened in a good economy. There is no formula that will automatically mean that your business will be successful, but there are things you can do to try to attract customers to your business. If you want to attract customers, keep these things in mind when you plan your business. 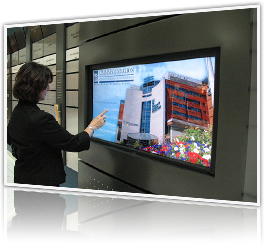 How do you think interactive signage would help your business?